Sine wave filter is fine if you have long motor leads or want to operate with a high carrier frequency. 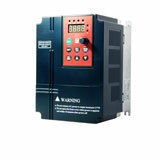 A high carrier frequency will cut down on motor heating but increase heat in the VFD. Yaskawa has great product. I am very familiar with Yaskawa, Toshiba and Control Techniques. All of these state a constant torque v/F pattern capable of 20:1. Any vector control variable frequency drive should be capable 100:1 in open loop vector control. If it doesn't - don't buy it. Closed loop vector control is great for web tensioning applications but has little meaning if you don't need 1000:1 and is adds complexity. A good aluminum rotor motor with an external fan (a better way to spend your money) should fit this application fine and save gobs of money. If cooling is still a concern, oversize the thing to add mass. Toshiba, Marathon, and many others could handle this motor and be readily available in North America. The main thing is to properly tune the VFD. Personally, I would not trust autotune, especially if you are going to use a motor with 6 or more poles. Get a motor map from the manufacturer and have a competent tech tune it or get the programming from the factory application engineers. I like the approach of using a low speed motor vs. a higher speed with a gearbox. Gearboxes are really inefficient and add mass and volume to the application. VFDs are so good these days that doing it your way should be a fairly simple matter. 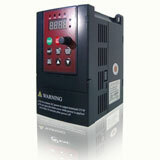 VFD manufacturers have responded to this demand by manufacturing a variety of VFDs. The combination of the many types of VFDs available and the abundance of applications has made the selection of the optimum VFD for a given application a challenge. Voltage drop along the cable will reduce the actual starting current. If we for example choose 25mm2 cable, we would have around 9% voltage drop at nominal load, over the 400m cable length.